As the original builders of this 50,000 sq. 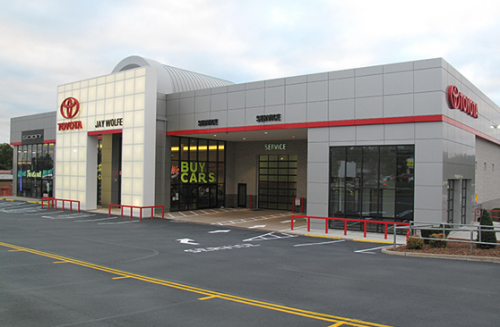 ft. full service Toyota dealership (completed in 2002), we were asked by the owners—in 2013—to upgrade the facility with the latest in Toyota Image 2 dealership improvements. This would include the installation of the new Toyota Entrance Portal, ACM cladding at the exterior fascia, and a New Vehicle Delivery Center. We remodeled the Service Writers Office, Customer Restrooms and a Customer Lounge which required the installation of a brand new, full service Café.